For Bondi Labs, its human plus machine rather than human vs machine as they apply 3D simulated virtual reality to improve safety in logistics. Video games may traditionally be regarded as entertainment, or even child’s play, but a recent study by the Interactive Games & Entertainment Association found that at least a third of Australians surveyed have played games in the workplace to gain knowledge. For Bondi Lab’s Founder and Managing Director, Jonathan Marshall, using games as a platform for developing training tools in the logistics industry will help people to engage, improve and standardise behaviour. “With gaming, you create a 3D simulated environment whereby you incentivise, measure and track behaviour. What we are essentially recreating is a flight simulator ­– but for the logistics industry,” Jonathan says. Bondi Labs created its first 3D simulated virtual reality training solution for biosecurity inspection on the largest LNG project in the world. This project was unique in that it is located on Barrow Island, a Class A Nature Reserve. “The Island is home to many protected species, because it’s never been exposed to many people. Any invasive pests carried by humans working on the island could potentially wipe out these species. Because of this one of the most stringent biosecurity risk management protocols in the world was put in place,” Jonathan says. For Chevron, the global energy giant managing the project, the stakes were extremely high. The $70 billion dollar project, which during the construction phase had several flights every day back and forth from Perth and up to 10,000 construction workers on the island at its peak – a major biosecurity breach would be a significant setback. “If an invasive pest that got onto the island from a piece of machinery, a container or someone’s shoe or clothing was found this could lead to an eradication process which could take several days or more creating significant delays and associated costs potentially in the millions,” he says. According to Jonathan, this was a significant pain point for Chevron. Even with the best biosecurity inspectors in the world, including those from the Australian and New Zealand government, there were still cases of human error and fallibility. The first step was for the team at Bondi Labs to monitor everything that the inspectors were doing. “We spent almost a week at the Perth airport, with go-pro cameras on all the inspectors, and cameras in every corner of the room and basically being anthropologists watching the inspectors’ behaviour,” Jonathan says. The footage revealed that often inspectors had significantly different approaches to the inspection task which they needed to do. For example, some may inspect the top of the shoe for longer than the bottom though it is the bottom of the shoe where most biosecurity risk material would be found. To improve core inspection skills and increase performance standardisation, Jonathan and his team worked alongside the Chevron Biosecurity Risk Management team and created an immersive, virtual world where the inspectors could train and be assessed in a fail-safe environment ­– much like flight simulation training for pilots. After working in the biosecurity sphere, Jonathan’s team recognised that any industry that required safety training could benefit from this style of learning, and Bondi Labs moved its focus to logistics and warehouse safety. 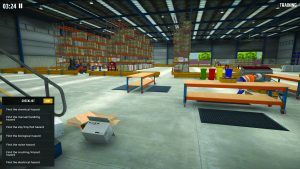 Bondi Labs adapted its original biosecurity simulation training and built a range of new virtual environments including a virtual warehouse, sea port and supply base, whereby for example warehouse workers can now be trained to spot safety hazards. Learning from the productive experience collaborating with Chevron’s Biosecurity experts to develop training that is genuinely effective – Bondi Labs partnered with global industry logistics company DB Schenker to co-design their cloud based, WHS simulation training product Kuube, specifically for the logistics and warehouse industries. Over the past five years Bondi Labs has developed a sophisticated online platform design built specifically for simulation training as well as creating an extensive library of hundreds of virtual assets. 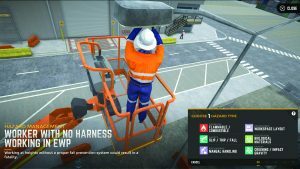 These virtual assets can be re-used and re-purposed to develop simulation training scenarios which address key WHS competency needs such as forklift and material handling equipment pre-start safety checks ­– a known safety issue in the logistics industry. With scalability a crucial requirement for both DB Schenker and Chevron, Kuube was designed to work on standard office desktops through to iPads and even VR devices. Jonathan again uses the example of pilots ­­– stating that they need to spend a set number of hours per month in a flight simulator to ensure their task performance standards remain high. He compares this to a warehouse worker or forklift driver who currently might only have an online induction and refresher course once a year and perhaps the occasional tool-box discussion. But that’s not enough if you genuinely want to improve workplace safety standards, Jonathan says. “By creating an engaging ‘learning by doing’ user experience you can genuinely develop and assess individual employee WHS competencies. Safety training should never be just a tick and flick exercise which unfortunately so often is the case in the logistics industry,” he says. Jonathan and his team are excited about what this new way of training could mean for safety in the logistics industry, saying there are upwards of half a million people working in the sector who are faced with potentially serious safety risks every day as well as the public. “Our goal is to work with those businesses who take workplace safety seriously and want to do the right thing by their employees but also ensure they are compliant from a regulatory standpoint’ Jonathan says. 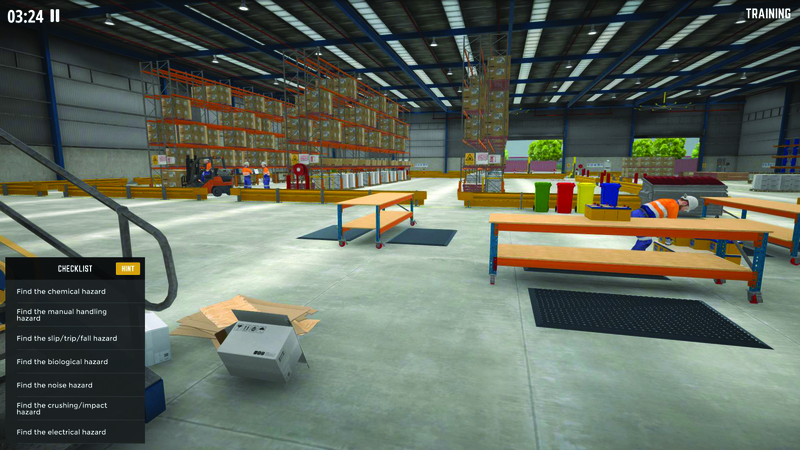 Bondi Labs is entering into a strategic partnership with the Supply Chain and Logistics Association of Australia (SCLAA), to offer their 3D simulation training product Kuube to SCLAA’s 8000+ members and together start driving serious change in workplace safety awareness and competency especially within the context of the new CoR compliance requirements for the logistics industry. For Bondi Labs, this kind of technology is designed to ensure people work smarter and more productively as opposed to a growing trend to focus purely on automating roles. “We want to use advanced people centric technology such as 3D simulation and virtual reality to enhance upskill the workforce and improve competencies. We think this style of technology-based ‘learning by doing’ has so many leverage effects including attracting younger people to this industry and even for sales and marketing purposes,” he says. “Games are cool and if we can take this kind of training technology into schools and show students that logistics is at the cutting edge of emerging technologies then we can help discredit the stigma that logistics is a dull and uninteresting industry to work in,” he says. Though as the industry develops and automation becomes more prevalent, Jonathan believes this kind of training and learning will be key to upskilling the logistics workforce on how to work with new new technology and hardware.